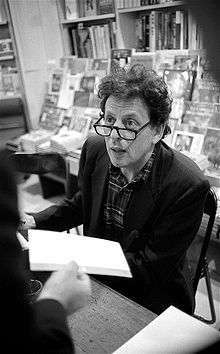 Philip Morris Glass (born January 31, 1937) is an American composer. He is considered one of the most influential music makers of the late 20th century. Although his compositions were often described as minimal music, as were other "minimalists" such as La Monte Young, Terry Riley, Glass has since distanced himself from the "minimalist" label, describing himself instead as a composer of "music with repetitive structures", which he has helped evolve stylistically. Currently, he describes himself as a "classicist", pointing out that he is trained in harmony and counterpoint and studied such composers as Franz Schubert, Johann Sebastian Bach, and Wolfgang Amadeus Mozart with Nadia Boulanger. 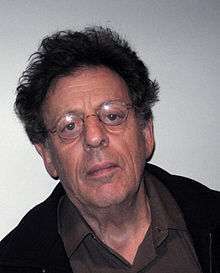 Glass has founded a namesake musical group, the Philip Glass Ensemble, with which he still performs on keyboards, and has written 24 operas, musical theatre works, ten symphonies, eleven concertos, solo works, chamber music including seven string quartets and instrumental sonatas, and film scores. Three of his film scores have been nominated for Academy Awards. As a child, Glass built up a sizable record collection of his own from the unsold records in his father's store, including modern classical music such as Hindemith, Bartók, Schoenberg, Shostakovich and Western classical music including Beethoven's string quartets and Schubert's B♭ Piano Trio. Glass cites Schubert's work as a "big influence" growing up. He studied the flute as a child at the university-preparatory school of the Peabody Institute. At the age of 15 he entered an accelerated college program at the University of Chicago where he studied mathematics and philosophy. In Chicago he discovered the serialism of Anton Webern and composed a twelve-tone string trio. In 1954 Glass went to Paris for the first time, encountering the films of Jean Cocteau, which made a lasting impression on him. He visited artists' studios and saw their work; "the bohemian life you see in [Cocteau's] Orphée was the life I ... was attracted to, and those were the people I hung out with." Glass' musical style is instantly recognizable, with its trademark churning ostinatos, undulating arpeggios and repeating rhythms that morph over various lengths of time atop broad fields of tonal harmony. That style has taken permanent root in our pop-middlebrow sensibility. Glass' music is now indelibly a part of our cultural lingua franca, just a click away on YouTube. Glass's music for his ensemble culminated in the four-hour-long Music in Twelve Parts (1971–1974), which began as a single piece with twelve instrumental parts but developed into a cycle that summed up Glass's musical achievement since 1967, and even transcended it – the last part features a twelve-tone theme, sung by the soprano voice of the ensemble. "I had broken the rules of modernism and so I thought it was time to break some of my own rules", according to Glass. Though he finds the term minimalist inaccurate to describe his later work, Glass does accept this term for pieces up to and including Music in 12 Parts, excepting this last part which "was the end of minimalism" for Glass. As he pointed out: "I had worked for eight or nine years inventing a system, and now I'd written through it and come out the other end." He now prefers to describe himself as a composer of "music with repetitive structures." In the mid-1980s, Glass produced "works in different media at an extraordinarily rapid pace". Projects from that period include music for dance (Glass Pieces choreographed for New York City Ballet by Jerome Robbins in 1983 to a score drawn from existing Glass compositions created for other media including an excerpt from Akhnaten; and In the Upper Room, Twyla Tharp, 1986), music for theatre productions Endgame (1984) and Company (1983). Beckett vehemently disapproved of the production of Endgame at the American Repertory Theater (Cambridge, Massachusetts), which featured JoAnne Akalaitis's direction and Glass's Prelude for timpani and double bass, but in the end, he authorized the music for Company, four short, intimate pieces for string quartet that were played in the intervals of the dramatization. This composition was initially regarded by the composer as a piece of Gebrauchsmusik ('music for use')—"like salt and pepper (...) just something for the table", as he noted. Eventually Company was published as Glass's String Quartet No. 2 and in a version for string orchestra, being performed by ensembles ranging from student orchestras to renowned formations such as the Kronos Quartet and the Kremerata Baltica. Glass also returned to chamber music; he composed two String Quartets (No. 4 and No. 5, for the Kronos Quartet, 1989 and 1991), and chamber works which originated as incidental music for plays, such as Music from "The Screens" (1989/1990). This work originated in one of many theater music collaborations with the director JoAnne Akalaitis, who originally asked the Gambian musician Foday Musa Suso "to do the score [for Jean Genet's "The Screens"] in collaboration with a western composer". Glass had already collaborated with Suso in the film score to Powaqqatsi (Godfrey Reggio, 1986). Music from "The Screens" is on occasion a touring piece for Glass and Suso (one set of tours also included percussionist Yousif Sheronick ), and individual pieces found its way to the repertoire of Glass and the cellist Wendy Sutter. Another collaboration was a collaborative recording project with Ravi Shankar, initiated by Peter Baumann (a member of the band Tangerine Dream), which resulted in the album Passages (1990). Two months after the premiere of this opera, in November 2005, Glass's Symphony No. 8, commissioned by the Bruckner Orchester Linz, was premiered at the Brooklyn Academy of Music in New York City. After three symphonies for voices and orchestra, this piece was a return to purely orchestral and abstract composition; like previous works written for the conductor Dennis Russell Davies (the 1992 Concerto Grosso and the 1995 Symphony No. 3), it features extended solo writing. Critic Allan Kozinn described the symphony's chromaticism as more extreme, more fluid, and its themes and textures as continually changing, morphing without repetition, and praised the symphony's "unpredictable orchestration", pointing out the "beautiful flute and harp variation in the melancholy second movement". Alex Ross, remarked that "against all odds, this work succeeds in adding something certifiably new to the overstuffed annals of the classical symphony. (...) The musical material is cut from familiar fabric, but it's striking that the composer forgoes the expected bustling conclusion and instead delves into a mood of deepening twilight and unending night." The Passion of Ramakrishna (2006), was composed for the Pacific Symphony Orchestra, the Pacific Chorale and the conductor Carl St. Clair. The 45 minutes choral work is based on the writings of Indian Spiritual leader Sri Ramakrishna, which seem "to have genuinely inspired and revived the composer out of his old formulas to write something fresh", as one critic remarked, whereas another noted that "The musical style breaks little new ground for Glass, except for the glorious Handelian ending (...) the "composer's style ideally fits the devotional text". Glass's recently completed and projected works include Symphony No. 9 (2010–2011), Symphony No. 10 (2012), Cello Concerto No. 2 (2012, based on the film score to Naqoyqatsi) as well as String Quartet No. 6 and No. 7. Glass's Ninth Symphony was co-commissioned by the Bruckner Orchester Linz, the American Composers Orchestra and the Los Angeles Philharmonic Orchestra. The symphony's first performance took place on January 1, 2012, at the Brucknerhaus in Linz, Austria (Dennis Russell Davies conducting the Bruckner Orchester Linz); the American premiere was on January 31, 2012, (Glass's 75th birthday), at Carnegie Hall (Dennis Russell Davies conducting the American Composers Orchestra), and the West Coast premiere with the Los Angeles Philharmonic under the baton of John Adams on April 5. Glass's Tenth Symphony, written in five movements, was commissioned by the Orchestre français des jeunes for its 30th anniversary. The symphony's first performance took place on August 9, 2012 at the Grand Théâtre de Provence in Aix-en-Provence under Dennis Russell Davies. His opera The Lost, based on a play by Austrian playwright and novelist Peter Handke, Die Spuren der Verirrten (2007), premiered at the Musiktheater Linz in April 2013, conducted by Dennis Russell Davies and directed by David Pountney. Glass has collaborated with recording artists such as Paul Simon, Suzanne Vega, Mick Jagger, Leonard Cohen, David Byrne, Uakti, Natalie Merchant, and Aphex Twin (yielding an orchestration of Icct Hedral in 1995 on the Donkey Rhubarb EP). Glass's compositional influence extends to musicians such as Mike Oldfield (who included parts from Glass's North Star in Platinum), and bands such as Tangerine Dream and Talking Heads. Glass and his sound designer Kurt Munkacsi produced the American post-punk/new wave band Polyrock (1978 to the mid-1980s), as well as the recording of John Moran's The Manson Family (An Opera) in 1991, which featured punk legend Iggy Pop, and a second (unreleased) recording of Moran's work featuring poet Allen Ginsberg. In 2013, the all volunteer citizen's band of downtown New York City, The TriBattery Pops Tom Goodkind Conductor, recorded an album of Glass writings groomed by Glass sound designer Kurt Munkacsi. In the 2000s Glass's work from the 1980s again became known to wider public through various media. In 2005 his Concerto for Violin and Orchestra (1987) was featured in the surreal French thriller, La Moustache, providing a tone intentionally incongruous to the banality of the movie's plot. Metamorphosis: Metamorphosis One from Solo Piano (1989) was featured in the reimagined Battlestar Galactica in the episode "Valley of Darkness", and in 2008, Rockstar Games released Grand Theft Auto IV featuring Glass's "Pruit Igoe" (from Koyaanisqatsi). "Pruit Igoe" and "Prophecies" (also from Koyaanisqatsi) were used both in a trailer for Watchmen and in the film itself. Watchmen also included two other Glass pieces in the score: "Something She Has To Do" from The Hours and "Protest" from Satyagraha, act 2, scene 3. In 2013 Glass contributed a piano piece "Duet" to the Park Chan-wook film Stoker. ↑ "Philip Glass Biography – Facts, Birthday, Life Story". Biography.com. Retrieved March 29, 2013. ↑ Scott Hicks (2007). Glass: A Portrait of Philip in Twelve Parts. Event occurs at 33:20. ↑ Contemporary Authors. New Revision Series. Vol. 131 (Farmington Hills, MI: Thomson Gale, 2005):169–180. ↑ "Philip Glass Biography (1937–)". Filmreference.com. Retrieved September 20, 2011. ↑ John O'Mahony (November 24, 2001). "When less means more | Education". London: The Guardian. Retrieved March 29, 2013. ↑ Joe Staines (May 17, 2010). The Rough Guide to Classical Music. Penguin. p. 209. ISBN 978-1-4053-8321-9. Retrieved March 20, 2012. ↑ Maddocks, Fiona (2015-04-26). "Words Without Music review – Philip Glass's deft, quietly witty memoir". The Guardian. ISSN 0261-3077. Retrieved 2016-03-27. ↑ Wroe, Nicholas (13 October 2007). "Play it again ...". The Guardian. Retrieved 19 April 2016. ↑ Stetson, Greta. "Philip Glass wishes he had time to take a four-hour hike". watchnewspapers.com. ↑ "But Is it Music?". In Their Own Words; 20th-Century Composers. Episode 2. 2014-03-21. BBC. ↑ "Concerto for Cello and Orchestra on ChesterNovello website". Chesternovello.com. May 31, 2005. Retrieved September 20, 2011. ↑ "Entertainment | Philip Glass opera gets ovation". BBC News. September 12, 2005. Retrieved September 20, 2011. ↑ "Culture Monster". Los Angeles Times. November 19, 2009. ↑ London Philharmonic Orchestra <http://lpo.org.uk> (April 17, 2010). "London Philharmonic Orchestra April 17, 2010". Shop.lpo.org.uk. Retrieved September 20, 2011. ↑ "Maria Bachmann Schedule". Mariabachmann.com. Retrieved September 20, 2011. ↑ Interviews from Tasmania 22SQ and Philip Glass (January 21, 2011). "Glass Notes: ''Interviews From Tasmania''". Philipglass.typepad.com. Retrieved September 20, 2011. ↑ La Rocco, Claudia (May 5, 2011). "Dance". The New York Times. ↑ "Culture Monster". Los Angeles Times. February 25, 2011. ↑ "Philip Glass talks about his Carmel Valley festival this summer and hoped-for Big Sur center – San Jose Mercury News". Mercurynews.com. Retrieved December 2, 2011. ↑ "American Composers Orchestra – Tuesday, January 31, 2012". Carnegie Hall. Retrieved September 20, 2011. ↑ Purvis, Bronwyn (January 21, 2011). "Music is a place; Philip Glass in Hobart – ABC Hobart – Australian Broadcasting Corporation". Australia: ABC. Retrieved September 20, 2011. ↑ Ayala, Ted (April 9, 2012). "LAPO and John Adams perform West coast premiere of Philip Glass' Symphony No. 9". Bachtrack. Retrieved April 10, 2012. ↑ "Philip Glass 'Symphony No. 9' at PhilipGlass.com". PhilipGlass.com. Retrieved April 22, 2012. ↑ "Philip Glass The Perfect American at Chester Novello Music". ChesterNovello.com. Retrieved April 22, 2012. 1 2 "Philip Glass' The Perfect American to Open in Madrid". The Huffington Post. February 10, 2012. Retrieved April 22, 2012. ↑ "Philip Glass Disney opera to get UK premiere at ENO". BBC.co.uk. April 24, 2012. Retrieved April 22, 2012. ↑ Glass, Philip (2015). Words Without Music. Liveright. ISBN 9780871404381. ↑ "Music: Ignorant Sky". Philip Glass. Retrieved September 20, 2011. ↑ "Music: Film: Bent". Philip Glass. Retrieved September 20, 2011. ↑ "Music: Planctus". Philip Glass. February 17, 1997. Retrieved September 20, 2011. ↑ Allan Kozinn (June 8, 2012). "Electronic Woe: The Short Lives of Instruments". The New York Times. Retrieved March 29, 2013. ↑ "Meet Phillip Glass". Smithsonianmag.com. Retrieved March 29, 2013. ↑ "Music: North Star". Dunvagen Music Publishers. Retrieved March 29, 2013. ↑ "Philip Glass: Music: Dance Nos. 1–5". Dunvagen Music Publishers. October 19, 1979. Retrieved March 29, 2013. ↑ Philip Glass (January 31, 1937). "Philip Glass – Credits". AllMusic. Retrieved March 29, 2013. ↑ "The Moustache: Movie Review". Highbeam.com. Retrieved September 20, 2011. ↑ Storm, Jo (2007). Frak you! : the ultimate unauthorized guide to Battlestar Galactica. Toronto: ECW Press. p. 109. ISBN 9781550227895. Retrieved 2 January 2016. ↑ "Hear Philip Glass' 'Duet' From Park Chan-wook's Psycho-Sexual Thriller 'Stoker'". spinmedia.com. Retrieved August 17, 2015. ↑ O'Mahony, John (November 24, 2001). "When less means more". The Guardian. UK. Retrieved November 10, 2009. ↑ The International Who's Who, 1997–98 (61st ed.). Europa Publications. 1997. ISBN 9781857430226. Retrieved March 29, 2013. ↑ Q&A With Philip Glass and his girlfriend Wendy Sutter – New York, February 10, 2008. Retrieved May 8, 2010. ↑ Skipworth, Mark (January 31, 2011). "Philip Glass shows no signs of easing up". The Daily Telegraph. London. ↑ "NEA Chairman Rocco Landesman Announces Recipients of the 2010 NEA Opera Honors". June 24, 2010.